Target any number of monsters in your GY; Special Summon them, and if you do, you lose 1000 LP for each monster Special Summoned by this effect. You cannot conduct your Battle Phase the turn you activate this card. You can only activate 1 "Soul Charge" per turn. This card's artwork is a modified version of Muko. Special Summoning the targeted monsters and losing Life Points are considered to happen simultaneously. If 2 or more monsters are targeted, then those monsters are considered to be Special Summoned simultaneously. You cannot conduct your Battle Phase the turn you activate "Soul Charge". If you cannot conduct your Battle Phase, then the Battle Phase of that turn is not skipped by the effect of your opponent's "Artifact Ignition". Therefore, your next Battle Phase is skipped by the effect of your opponent's Artifact Ignition. : If you activate "Soul Charge" during the Main Phase 1 and then you destroy an opponent's Set "Artifact Ignition", which Battle Phase is skipped? If "Soul Charge" is activated targeting 3 monsters in your Graveyard and the opponent activates the effect of "D.D. Crow" in a Chain targeting 1 of those monsters, then even if 1 of the 3 targeted monsters is banished by the effect of "D.D. Crow", the remaining 2 monsters are still Special Summoned. Furthermore, since you only Special Summoned 2 monsters, you lose 2000 Life Points for the "you lose 1000 Life Points for each monster Special Summoned by this effect." effect. 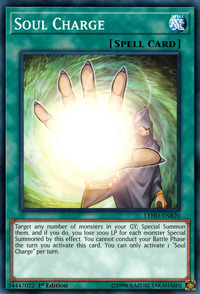 : If "Soul Charge" is activated targeting 3 monsters in your Graveyard and the opponent activates the effect of "D.D. Crow" in a Chain, how does the effect of "Soul Charge" resolve? This card can be activated during the first turn of the Duel if you have 1 or more monsters that can be Special Summoned in your Graveyard. : Can "Soul Charge" be activated during the first turn of the Duel?